The metal communities were surprised with the arrival of new power metaller from Russia, Hammerforce. Their latest album Access Denied (Metal Harem review here) were accepted with great enthusiast. The inclusion of synthesizer attack in metal genre got re-touch when Hammerforce introduce this to us in this album. Metal Harem takse the changes to wrote few Questions and Answer for the band's spoke person, keyboardist and guitarist Nikita. Read this insightful interview about their struggle in metal music, internet power and Russian version of their album. Visit their website as well and support the band. Here is Nikita Merzlyakov from Hammerforce. 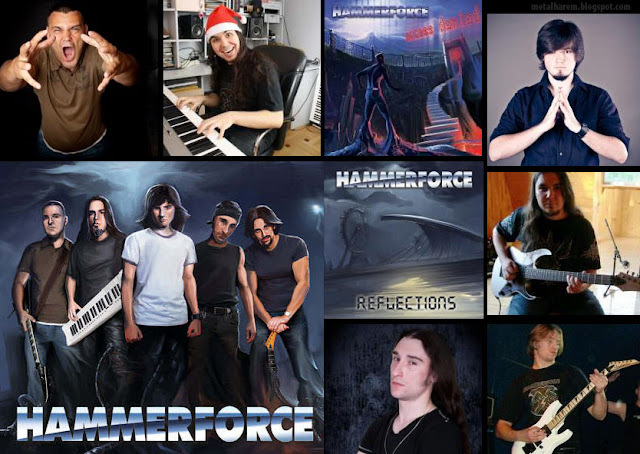 I am keyboardist, arranger, sound producer/engineer, manager and partially rhythm guitarist in the band and together with Ilya Kapralov we form the heart of Hammerforce. Metalharem.blogspot: Can you briefly (or lengthy ... ) describe how you guys come together and formed a band? Are you come from same school or met later in the process of making a band? Nikita: Hammerforce actually evolved from local Power/Prog Metal band Legioner that played live in Saint-Petersburg and recorded few demos. Legioner was formed by Ilya Kapralov and Alexander Moroz (drummer on “Dice” album) in 1998. They met on audition for one band and ended up with their own band. I joined them in 2003 as rhythm guitarist. I was looking for a band and discovered them playing live on festival. Luckily guys were looking for a guitarist. As time passed I also addicted to synthesizers and now I am more keyboardist than guitarist. In 2006 Ilya and I decided to take our music to the new level: record full-length album and spread it all around the world. While it was common for European bands that time, there still were very few Metal bands in Russia with good recorded albums and with any presence outside Russia. Legioner had only Russian lyrics and Legioner itself is a Russian word (Легионер) that means “legionary”. In addition we had new members and new attitude. So the change of name was needed. That was how Hammerforce was born. Metalharem.blogspot: In your new 2013 album, Access Denied, there is high energy of metal music, and interestingly additional of synthesizer sound along the guitar riff. How you guys come with this approach? Are you deliberately composed the music in such way, or it is a spontaneous come from your band member (supposedly the keyboardist) ? N: Well, it’s my “fault” ;) It was absolutely intended and elaborated. I love 90’s Eurodance music such as Masterboy, DJ Bobo, Maxx, E-Rotic, etc. It probably seems weird to like such music being hairy and beardy metal head. But that is what I am and I can nothing to do about that. I think it is boring to play traditional Heavy/Power Metal these days. There should be some fusion of musical styles or may be even developing of new styles to keep music being interesting. I know that many die-hard metal fans aren't agree with this as it doesn't seem to be “true” to them. Okay, there are a lot of True Metal bands out there. =) We just try to combine some old things and not so old things to get some new and hopefully interesting results. We really love what goes out and plan to make more in the future. N: Oh, it was very long journey. This time I decided to record, edit, mix and master everything myself at my private studio. It took about 3 years of trials and errors to get things right. But I believe it was worth it. This approach lets to control every detail of recording and mixing process and not to give a compromise to third party producers and sound engineers. So the album you listen to sounds exactly as band wanted it to sound. As for songwriting process, we do it little unusual way either. First of all Ilya composes all guitar riffs and structure of a song. After that Dmitriy and I compose vocal melodies. Sometimes we have two or even more different vocal melodies for one part of a song: from Dmitriy and from me, so we have to choose from. After everything is recorded I start working on synth arrangement. Dmitriy is really genial lyricist. He writes lyrics on the fly, just needs to choose topic beforehand. We decided to devote this album to social problems that we see in our everyday life. Why to sing about nonexistent things like dragons or devil while we can try to make our real world little better and kinder. So our inspiration is just real life. Q: Can you give in brief background story of songs from this album? Maybe one or two interesting ones? N: Hmm… Song “Mass Media” was the first composed for this album. And there were good chances to name the album “Mass Media”. We really are concerned about the power mass media has nowadays. Sadly this power is very often used just to fool people or make them buy things they don’t actually need. Most people don’t even notice it or think about it but it is all around us yelling and blinking, diverting attention from what really matters. We couldn't pass it by and here is the song! Another important topic is touched in “Templates for All”. It is not new (remember Helloween’s “I Want Out”?) but we are still the same slaves of stereotypes and social templates as 25 years ago. People often don’t even think why they do things, just do because everybody does. Human is creative being and one should use one’s own brain. I don’t mean that we must throw away all external influence. But it is much better to decide yourself what is better for you. If we can change this even a little we must take our chance. All other songs have same significant ideas which hopefully help, dig it out yourselves. Q: What is the most influential bands to Hammerforce, can you point out the old bands (Helloween, maybe) and your contemporaries this day (Avantasia, Dragonforce etc.) ? Any favorite ones? Q: In the era of digital information, how would you approach the rise of internet. How you guys been benefit from the usage of Youtube, Blogging, social network, itunes etc in reaching the market. 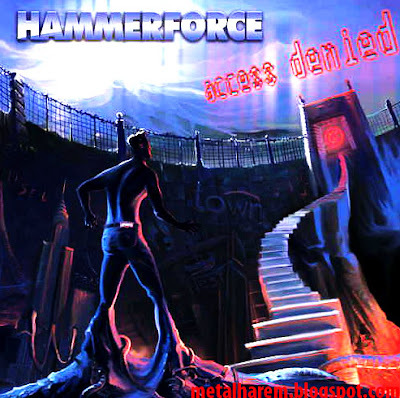 Q: What is Hammerforce's next step after the release of Access Denied? Will be there a tour to Europe or other region being scheduled? Nikita: Many fans ask us about touring. The truth is that we decided not to play live until we get enough fans to make good tour with good sound and at good venues. We believe that it is better to spend our time and effort on writing and recording new songs for now. We have fans in a huge amount of different countries, but we can’t afford long world tour now (to be honest we can’t afford any short and small tour for now as well). So while we are on tour many of our fans that live in other cities and countries will just sit down and wait for next songs. That is not fair I think. List of most recommended metal album by each year.